On the ground floor of my apartment building is a small shop that just went out of business. It used to sell snowboard clothes but during two years of residence I never spotted a single customer inside. Lacking a great cafe in my neighborhood, I would love the next person thinking about hanging their shingle to have a way to get an idea of what the market might be interested in. What dreams does our neighborhood have for the erstwhile snowboard shop? Now that we have a tiki bar down the street, surely there’s something else that would compliment the existing offerings on Uudenmaankatu, or the broader neighborhood of Punavuori. The thing is, the shops and services in urban centers have very weak feedback systems. Without the support and coffers of a syndicate that is able to conduct market research, an aspiring shopkeep has few tools to use other than subjective asking around. Mostly they test their hypothesis on the mean streets the old fashioned way: scraping together some cash and giving it a go. A website called Kickstarter has grown into a community that made 386,373 investments in 2010 for a total of $27,638,318 dollars committed to capitalize projects ranging from iphone accessories to epic dance films. One thing I like about Kickstarter is that it turns entrepreneurship into a tool rather than letting it be the endgame. It’s not about building an enterprise, but using entrepreneurship to manifest an interest that is shared by creator and investor/customers. It turned the often-brutal realm of entrepreneurship into a more supportive, community oriented way to manifest new bits of reality. This is what community-scale rapid prototyping looks like. From the buyer’s perspective Kickstarter is a marketplace of freshness, packaging specific deliverables with an extended aura of pay as you go DIYness. It allows customers to buy something that doesn’t exist yet—to vote on the specific future they want to live in, one product at a time. This brilliantly taps into the market trends that seem to be reacting to globalization by craving the unique, the limited, and the local. But from the producers’ side Kickstarter is something much different: it’s a demand aggregator that de-risks entrepreneurship. By allowing would-be entrepreneurs to collect commitments, they are able to look before they leap, as it were. Thereby expanding the pool of possible entrepreneurs to include individuals and groups who may never make the leap without some reassurance. So here’s my proposition: what would happen if you took the Kickstarter strategy and applied it to the city. How could we de-risk new shops, restaurants, cafes, services, institutions, and even government outposts by aggregating commitment in advance of capital investment? 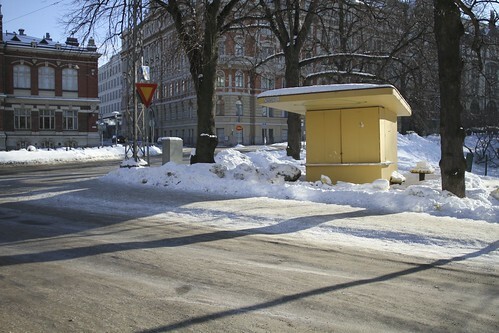 One of Helsinki’s many under-utilized spatial assets. What would the Kickstarter of real estate look like and how might a similar demand-aggregator offer a productive counterpart to the dreaded “not in my back yard” syndrome? Is there a “please in my backyard” platform that could act as a spatial happiness engine, better empowering individuals to inflect their own corner of the city to meet their personal desires? Could a platform such as this translate land use and zoning decisions into terms that are more personable, assessable, and ultimately arguable? Would that make the city more or less democratic? Using a database of vacant real estate in a given city and a platform for collecting propositions or pitches, we allow entrepreneurs a marketplace of ideas that is able to match their own predilections and interests with “please in my back yard” demand. Individuals vote on the future land use and spatial assets that they want to see in their own city and their own backyard. If that voting is done with the wallet, similar to Kickstarter, would it be enough to usefully bootstrap entrepreneurs? In 2004 Starbucks sold 21,000,000 gift cards totaling $312,000,000. That same year they had 8,569 stores globally. Assuming that the gift cards were available in all locations, and purchasing was distributed evenly, that’s a total of $36,410 spent on gift cards per store. If we divide it evenly across the 6,132 US-based locations it yields just over $50k per store. Not too shabby. That might be just enough to change the mind of the future antique dealer who’s eager to move in downstairs. Super interesting. Had a related discussion with Martti Tulenheimo today. 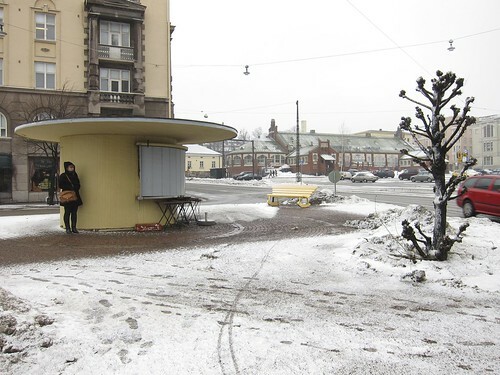 As a Helsinki-specific note, regarding all of those unused 1950′s kiosks, I think the main problem with their utilization is the myriad health inspection / hygiene bureaucracy that effectively makes any profitable food-related business practically impossible. Which is a shame. But let’s seriously do this. Incredible – I was just talking about a Kickstarter-type funding system for architecture. With the communication technology we have today, there’s no reason that we can’t start moving design-build projects along with the support of the interested parties.